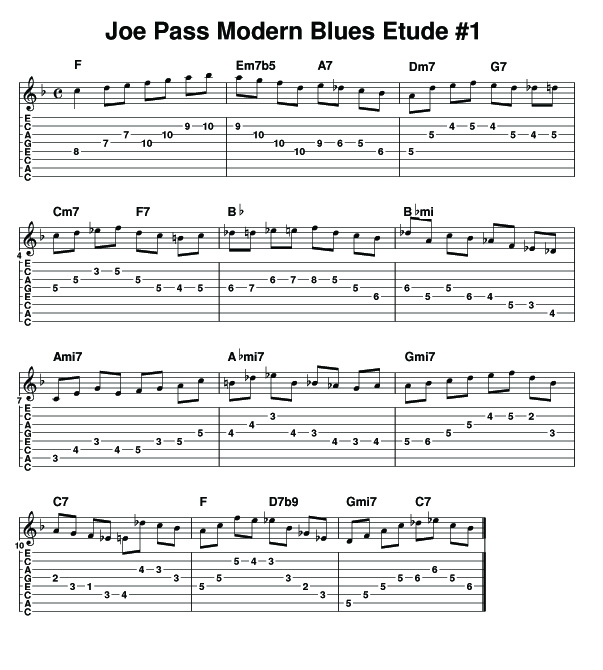 This is an etude written by Joe Pass in his Joe Pass Guitar Style book (orange cover) over the changes of a Bird Blues (Charlie Parker blues reharmonization) that I altered slightly. This reharmonization is the same as that found in Blues For Alice or Confirmation. As Joe was known to do, he created his etude in straight eighth notes with a solid outlining of the changes. This is arranged for straight C6 tuning with an A down on the bottom, but could easily be transposed to A6 by playing everything up 3 frets and down one string. If you’ve seen my book Steelin’ Scales and Modes, you will be familiar with the way I approach laying out lines for the non-pedal steel guitar in C6 tuning. Much of what you see in this tab reflects that approach. Here is a quick video of me playing (not perfectly) the etude.